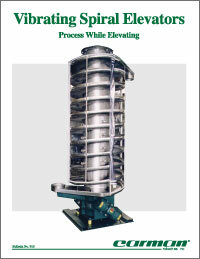 A Carman Spiral Elevator is the perfect way to accomplish multiple processes while elevating your product. If you need to heat, cool, dry, cure, dewater, or quench while elevating, a Carman Spiral Elevator is ideal for your application. Using factory-designed laboratory test equipment, Carman engineers can evaluate your process requirements, demonstrate equipment capability, and develop specifications for production equipment. If preferred, rental equipment for testing on your site is available. You can be assured of proven performance because a laboratory tested Carman Spiral Elevator includes a Process Warranty ensuring the unit will perform to your requirements. And, by optimizing operating efficiencies, Carman engineers are able to suggest the most economical equipment for your process.